Buck Akonua hunting knife model 402 with wood handles and original Buck sheath is mint with box and papers. Buck Akonua hunting knife model 402 with wood handles and original Buck sheath. This one is mint with box. It has not been sharpened or used. It is marked BUCK> USA. It is 9-3/4" overall is 3/16" thick. This is the smaller of the two presentation grade hunting knives and comes with an above average display box. Made 1987. This is El Cajon, California made for all you Buck collectors! 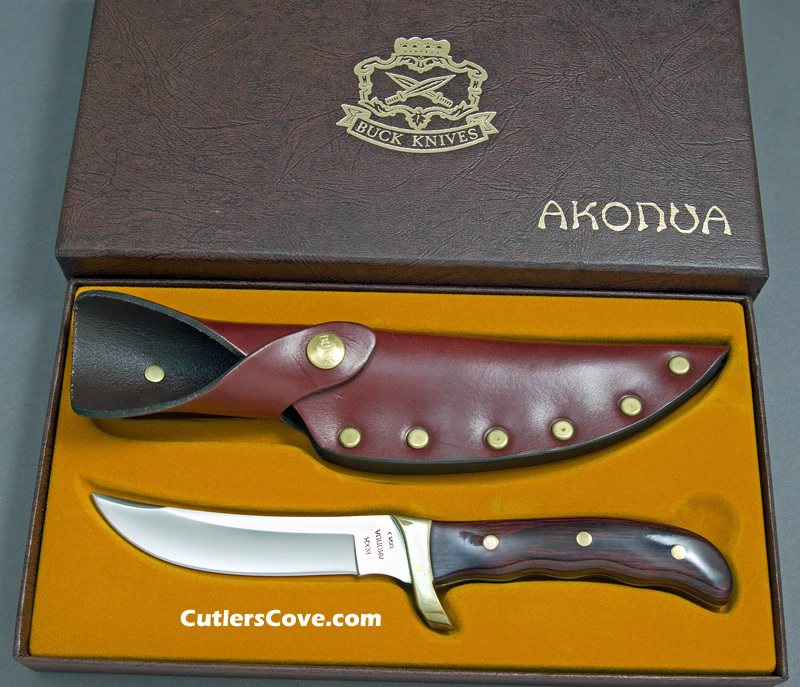 They have not made the Akonua wood handled knives in many years. Get this one before it is gone! There where four wood handled fixed blade knives that where the top of the line for Buck at that time. They made up the presentation grade knives and where the Frontiersman Bowie model 124; Hunter's axe model 106; Kalinga hunting knife model 401 and Akonua hunting knife model 402. This group of knives is no longer in production. Buck Kalinga model 401 with black Micarta handles and original Buck sheath. Buck Frontiersman Bowie with black Micarta handle that is in near mint condition.